When it comes to new products The Chord Company works on a simple principle: “If you can’t make something better, don’t make it at all”. This meant that when it came to considering USB cables, the first thing we did was to establish that USB cables did have an effect on the sound quality of the system they were used with. What we found was that like most other cables used in music systems, USB cables influenced detail, dynamics and tone, meaning that they had an effect on the coherence of the music being played through them. 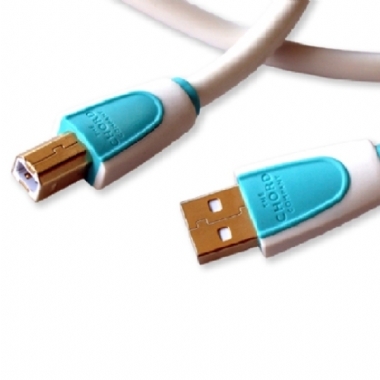 The Chord USB SilverPlus takes tried and tested Chord design principles and applies them to a USB cable. Conductors are built from silver-plated oxygen free copper conductors, insulation is a low-density polyethylene and the shielding is effective to high frequencies. The SilverPlus USB cable is a quick and simple way of improving the listening experience of any system using a standard USB cable. Most of our retailers are happy to let customers try cables out for themselves and the USB SilverPlus is worth listening to. Listen to the USB SilverPlus with: We find ourselves playing Laura Veirs “John Henry Lives” from the album “The Triumphs & Travails of Orphan Mae”. Hear: The steel guitar at the start of the song. Listen for: The definition that the USB SilverPlus brings to the sub bass at the end of the first verse.